Spring Cheer – Girls Place, Inc. Girls Place is offering a Spring Cheer program to all girls in Kindergarten to 8th Grade. The girls will learn the fundamentals of cheer in an energetic and encouraging environment. Click on the tabs to learn more. 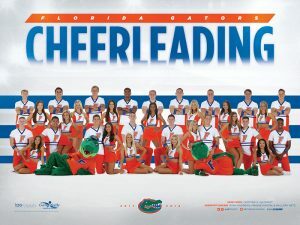 In the Fall of 2018, a cheer clinic with the University of Florida cheer team was offered to all girls in Kindergarten to 8th Grade. It will be much different than the previous clinic. The girls will learn how to be loud and proud to support their peers playing volleyball and running in our track programs. They will practice two days a week, and have a performance towards the end of May. We are excited to get the girls in the gym and encourage them to go beyond their comfort zones. The cost for the 2019 Spring Cheer season is $50. An active 2019 Girls Place Membership ($20) is also required to participate in all GP programs! Girls participating will be told what volleyball games and track meets they will be cheering at. When those games and meets are determined, times will be emailed to all parents. Practices will be held Tuesday and Thursday. Practices will take place for one hour either starting at 4:30 PM or 5:30 PM. Times will be announced by Friday, March 1st. Our coaches are all volunteers from the community who are passionate about cheerleading and giving back to their community. We rely on our volunteer coaches to provide a nurturing and enriching learning environment. We want to teach our girls how to play sports – starting with a solid foundation of the fundamentals and gradually implementing new skills and challenging them throughout the season. If you are interested in coaching this season, please complete our application! All coaches are required to complete a Level 2 FDLE Background Screening prior to coaching. **COACHES CLINIC – This season I will hold a mandatory coaches meeting. The meeting will comprise of expectations for the season, as well as going over the rules and how I want GP to be represented. Please contact me (Charlie@girlsplace.net) with any questions in regards to the clinic and I can explain any other details.